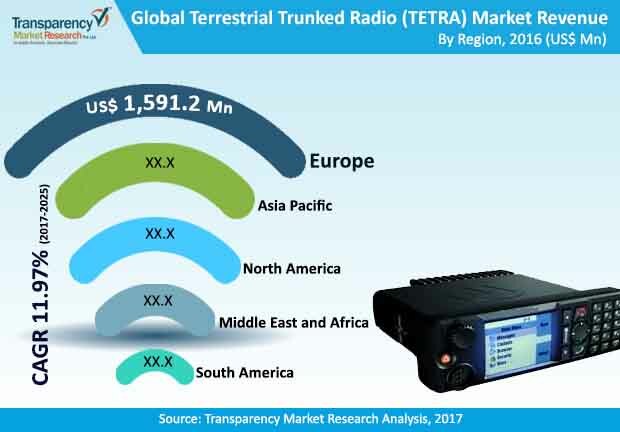 A fresh market intelligence study by Transparency Market Research (TMR) detects the global terrestrial trunked radio (TETRA) market is largely a concentrated one with key market share held by a few dominant players that operate globally as well in regional markets. In a highly competitive business landscape, prominent companies are striving to stay ahead by providing differentiator services such as in public safety and critical communication spaces. This is also helping these companies to expand their geographical outreach. For instance, in May 2017, Hytera Communications acquired Sepura Gropup Plc. to expand their services in the European region. Key players that operate in the global TETRA market include Motorola Solutions, ROHILL Engineering B.V., Damm Cellular Systems A/S, Airbus Defense and Space Oy, Rolta India Limited, Simoco Wireless Solutions, Cobham plc, JVCKENWOOD Corporation, Hytera Communications, and Leonardo among others. As per the TMR report, the global TETRA market is likely to expand at a healthy 11.97% CAGR during the forecast period from 2017 to 2025. At this pace, the market will become worth US$12,166.7 mn by the end of 2025. The application segments of the global TETRA market include transportation and logistics, aviation, oil & gas, public safety, and others. Of them, the public safety segment is anticipated to account for the leading revenue contribution to the overall market over the forecast period. Among the key component types, hardware is likely to occupy for the leading 43.9% revenue contribution to the TETRA market by 2025. Geography-wise, Asia Pacific TETRA market is a significant one mainly due to the adoption of TETRA in a host of service areas. First and foremost, the rising need to provide foolproof mission-control critical communication system for homeland security of nations is primarily driving the TETRA market. Further, the need to serve communication needs of various public safety agencies such as fire department, police, utility companies, and other services is also stoking the market’s growth. These agencies handle critical information that needs to be transmitted in a timely manner. TERA is a set of standards developed by the European Telecommunications Standardization Institute. The standard is developed to serve the mobile radio needs of various public safety agencies that handle critical data. Further, several governments in the world are deploying TETRA network for mission critical communication needs. For example, in 2015, the office of the public security secretary in Rio de Janeiro engaged a company called Teltronic to provide secure communications for the 2016 Rio Olympics. As per the contract, Teltronic provided TETRA network provided TETRA network across the region to be connected with approximately 18,000 police radios. In addition, TETRA has been deployed to provide secure foolproof communication for many global events. For example, in February 2017, Hytera bagged the contract for deploying TETRA systems for mobile radio needs of 2017 FIFA Confederation Cup. The increasing use of TETRA radios and base stations is also acting in favor of TETRA market. For example, in October 2017, Airbus S.A.S deployed TETRA base station for improved radio communication by a public telecommunication company based in Middle East.